photo-eye Gallery From the Flat Files: Chris McCaw & David Emitt Adams Materials have meaning. 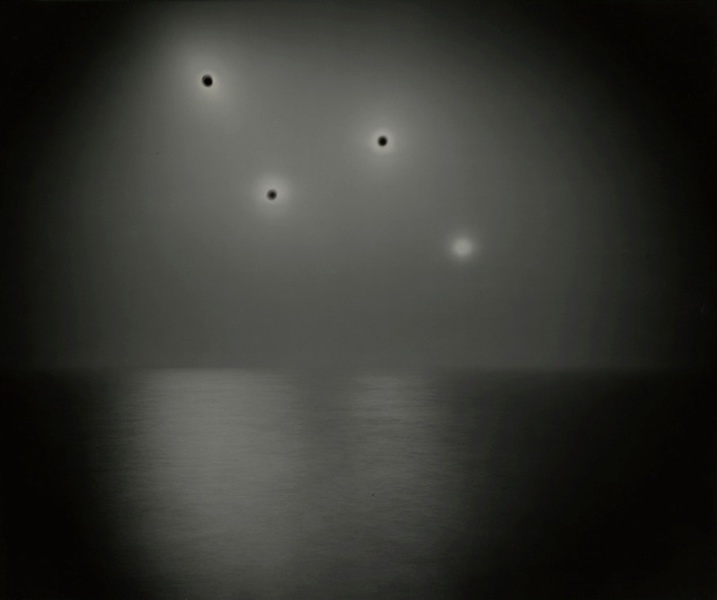 photo-eye's Lucas Shaffer highlights Chris McCaw and David Emitt Adams, who each forge robust and sculptural photographs with entirely unique results. Materials have meaning. This axiom has a long and storied history among photographers, and has prompted countless discussions about the implications of paper type, printer brand, or chemical developer upon image outcome and overall viewer perception. I myself have clear memories from my own photographic education justifying paper and developer combinations to instructors while dissecting the subtle nuances of print tone and patina amidst classmates. This week, however, I’d like to showcase two Gallery artists whose implement of photographic materials transcends those more common usages. Chris McCaw and David Emitt Adams forge robust and sculptural photographs with entirely unique results. Perhaps photographer Chris McCaw doesn’t need an introduction. His ongoing project Sunburn has caught fire in recent years, and McCaw’s work exhibits internationally, including: the Getty museum in LA, the Somerset House Trust in London, and right here at photo-eye Gallery in the 2012 exhibition Solar. Using giant homemade large format cameras, McCaw exposes antique and obsolete silver gelatin enlarging paper to direct sunlight for up to twenty-four hours. The effect is incredible. Over the duration of the extended exposure the paper solarizes, forming a visual positive, and the sun literally burns a hole in its jagged arching wake. These scenes are a dark and primordial expression of time, entropy, and the cyclical process of creation and destruction. Currently photo-eye Gallery has five of these one of a kind images on hand. For more information on Sunburn see David Ondrik’s review of McCaw’s monograph of the same name, or read Anne Kelly’s interview with the artist in 2012. View the entire portfolio. View images from the Solar Exhibition. David Emitt Adams Conversations with History also deals with time, photographic materials, and decay — but in a very different fashion. 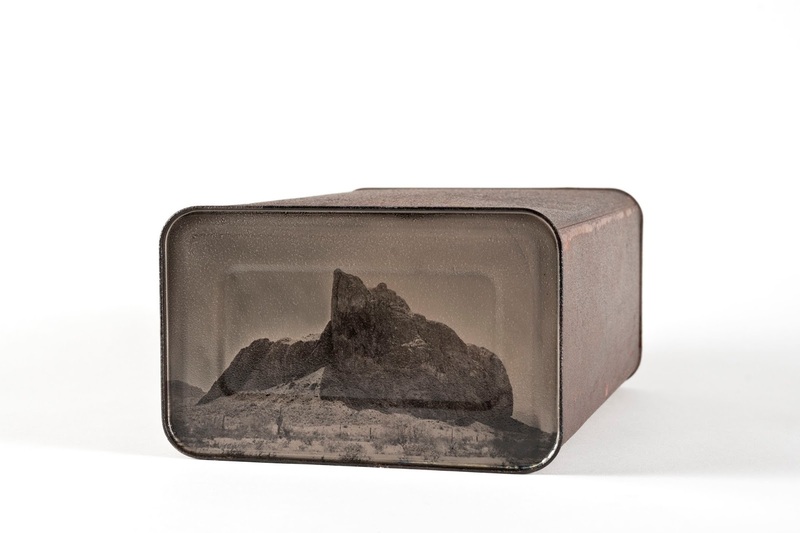 In Conversations with History, Adams photographs the Western American Desert landscape directly onto found tin cans using the antique Wet Plate Collodion process. Principally Adams is making a tintype on a tin can, which may sound cute, but the artistic and social implications and intentions run far deeper. The images appearing on each can are created on site at the exact location where the can was found in the desert, acting as a literal and beautiful timestamp for the object’s removal from its environment. Adams is also concerned with the American West, its rich photographic history, and the changes it’s witness in the last 150 years due to urban sprawl. The tin cans Adams elevates to art objects are evidence of the waste created as civilization encroaches on the land, and the photograph is a reference for the land civilization displaces. As a project Conversations with History is both well considered and immaculately executed. See more of David Emitt Adams Conversations with History in our Photo Objects and Small Prints online catalog.